Jeevan Lakshya is an excellent plan from LIC of India with innovative power packed features. 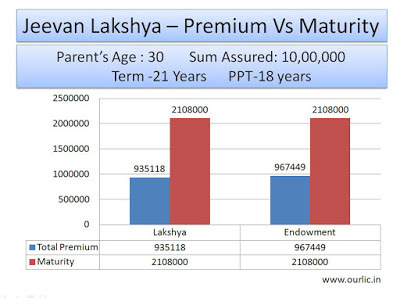 Jeevan Lakshya can help you in meeting the future educational and marriage expenses of your child. This plan provides high insurance benefits compared to ordinary endowment plans. As the name of the plan Lakshya – which means Aim – implies it can be used as an effective tool to ensure all the future needs of your child is met even if some thing unfortunate happens in between. Download a Power Point Presentation of Jeevan Lakshya to know its features. 1. No Premium Waiver Rider required. Insurance protection is to the parent even if it is taken to meet the educational expenses of the child. So there is no need to spend additional amount to add premium waiver benefit to the plan. A lump sum maturity amount guaranteed at maturity date irrespective of the survival or death of the parent(Proposer). Maturity benefit payable will be equal to the Sum Assured + bonus + Final Additional bonus in case of survival of proposer. An enhanced Sum Assured equal to 110% of Sum Assured along with Bonus and final additional bonus will be paid in case of unfortunate death of the parent. 3. Limited premium paying term. Premium paying term is lesser than the term of the policy by three years. This will help in reducing the financial burden as the child grows up and expenses are increasing. Another advantage is that the limited premium paying term helps this plan to reduce the total premium paid compared the endowment plans. Term Rider Benefit: Term rider benefit which is optional adds a new dimension to this plan by providing a death benefit equal to the term rider amount in case of unfortunate death of the parent. Accidental death and disability rider: Additional death coverage equal to the Sum Assured will be provided if the unfortunate death is occurring due to an accident. An inbuilt disability rider will help to tide over the difficult situation of disability due to accident. An amount equal to 10 percent of Sum Assured will be provided as half yearly instalments up to the date of maturity. 5. Three pronged benefits in case of unfortunate death of the parent (Proposer). a) All further premiums waived till maturity. b) Guaranteed Income benefit of 10 percent of the Sum Assured payable annually till the policy anniversary prior to the maturity date. c) An Enhanced Sum Assured of 110 percent of the Sum Assured is paid at the maturity date. Age at entry : 18-50 Age nearer birth day. A free Premium, Benefit and Maturity Calculator for all conventional plans of LIC can be downloaded from here. This software will give a fair idea about all the benefits of LIC policies. You can also compare the benefits of different plans using this software. Download Premium and maturity benefit calculator of all plans. on the other hand if you want online premium and benefit calculator click here. Know more about LIC’s New plan Jeevan Labh.